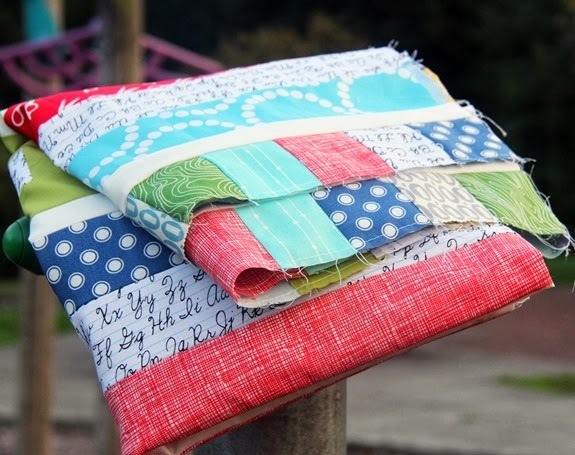 I made this little stack of fabrics in primary colors…just perfect for a back to school-ish quilt. 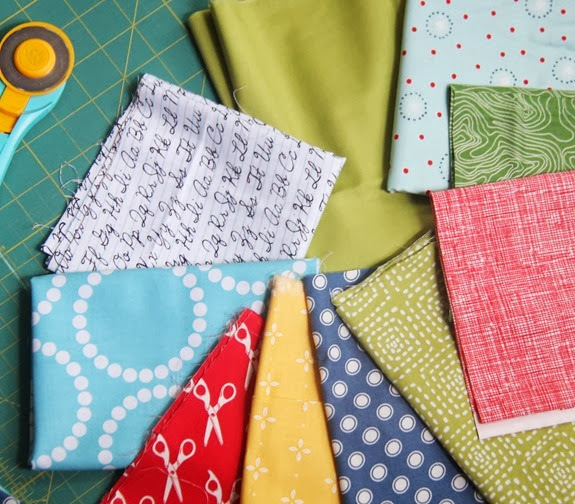 I think I’ll quilt it with a crosshatch pattern…after I get through my to-be-quilted stack! They all have a nice coat of fur now…1 black, 3 light gray, and 2 white-ish. Their eyes will open later this week and they’re getting very active. These are Holland Lops for those of you that asked. They make wonderful pets if you get one that has been held a lot and given lots of attention. your quilt looks adorable! I have your book, and I love all the great patterns! And of course the useful tips for busy mothers;) Cute bunny! Oh the bunny is so cute and fluffy and wonderful! The quilt is gorgeous too, especially the letters fabric – definitely a back to school vibe about it! I have your book and have made this quilt with some alterations to enlarge it. Love this pattern! Love the script fabric in this one. I'm thinking a back-to-school quilt and class pet bunny would go very well together for just the right teacher/ kinder classroom! Love the quilt, so fresh. The bunny? OMG! It's a good thing you're up north and I'm down south or we'd have to get a bunny. Great quilt ~ love all the colors. Ah, baby bunnies ~ so sweet. Cute quilt and adorable bunny! I think I fainted after seeing that little ball of cuteness!!! Adorable! Do your bunnies live inside or out? Thanks! Love the quilt top! I have one waiting to be quilted, I did the stripes in ROYGBIV for my rainbow loving girls. Should be fun! Can't wait to see how you finish yours! So pretty… love your fabric choices! And such a sweet little bunny too. Oh my! Very nice quilt! And the bunny is darn cute. Keep us posted on their growth. I have 2 lops and their ears are so cute when they're half up and half down. Adorable!! What a fun way to celebrate going back to school. I love bunnies, but unfortunately so does my Jack Russell, she loves them a little too hard. That quilt is so cute! I really like the colors you used. Gorgeous! I wish I had the time and patience to quilt… For now I'll just drool over this one :) Oh, and so jealous you get to hang out with baby bunnies!! No more bunny pictures—Seriously. My Yorkie would kill me if I brought another animal into this house—she is 12 1/2, and she's been an only for WAY too long. Is your momma rabbit litter trained? I have heard of people doing that, but when I had a rabbit, we just kept her outside. I love this quilt! I'm gonna have to get your book (and learn to quilt). 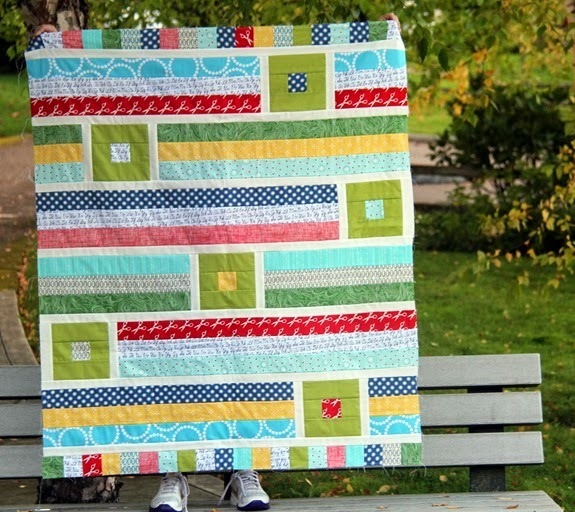 My favorite pic in this post…the sneakered feet poking out from under this gorgeous quilt top! Both the bunny and the quilt are charming! They both bring a lovely spirit of beauty and joy. Thank you! Love this quilt! We have your book at the quilt shop I work at, but never made the connection. Think I might have to pick it up this weekend when I work! Love it! 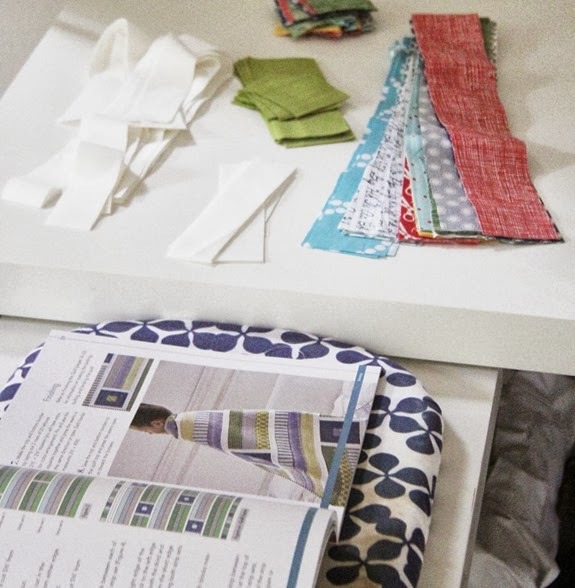 I have been a fan of your patterns for a while now and am excited about following your blog! Keep up the good work- always so fresh, crisp and bright- love it! Your quilt is wonderful. 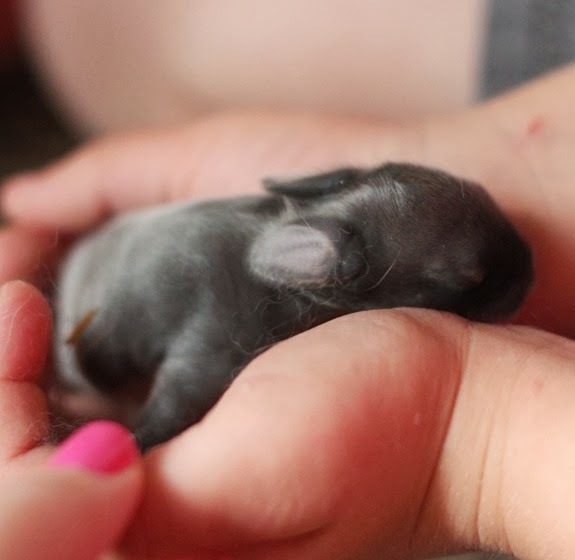 I love baby bunnies. Yours are so cute. I grew up on a farm and we were always having baby bunnies. LOL they just wanted to keep having them. LOL We loved taking care of them and finding them good homes. And yes the more they are held and loved and paid attention to they become the best little pets. and..your Baby bunnies are so adorable! Thanks for sharing your life with us. I love the quilt and the bunnies are so sweet! We are going to be getting bunnies ourselves but not until we move into our new house. I can't wait! Gorgeous quilt! OMG the baby bunnies are so adorable! The quilt is gorgeous. And who can resist that adorable bunny. If any of those bunnies are still available…I live in Los Angeles, but my boyfriend's father lives in Washougal — I could probably convince him to add a bunny to his farm or even bring it down to me from Washougal as he flies to LA every two weeks…just saying! So pleased because I really think this is the one…..and I don't know how I missed it first time around!